Try this Latin inspired chicken recipe with a citrus-parsley-onion topping! Mix the marinade and pressed garlic together in a bag, toss in the chicken and store in the fridge for 1-2 hours. Combine the chopped parsley, onion, and lime juice in a bowl. Cover and store in the fridge. /2 an hour after the chicken has been in the fridge, flip it over to allow marinade to coat both sides. 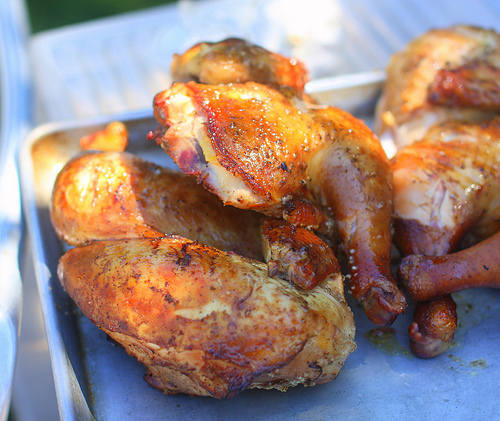 Once the chicken has marinaded for at least an hour, remove from bag and pat dry with a paper towel. Heat oil in a pan over medium high heat. Once the chicken has a slightly crispy texture, and is cooked through, remove from the pan and top with about a tbsp. of the onion topping. serves 4 pieces of chicken, double up!